In Part 1 we looked at some of the reasons why SPM / SRM Initiatives fail, in this article we will look in more depth at the impacts of failed SPM / SRM failed Initiatives, as well as some reasons / challenges as to why the Initiatives have failed in the first instance. 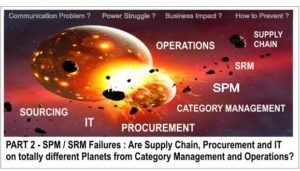 While there are many different functions involved in rolling out an SRM initiative it is important that IT, Procurement, Supply Chain, Category Management, and Operations are aligned on all aspects of what is needed for a successful initiative. SPM / SRM System does not meet the needs of all stakeholders. Lack of fundamental Stakeholder engagement at early stages of planning. Conflicts with existing IT systems. Costs of Running, Maintaining and Updating. Lack of Integration and Automation. If we look at the above list the roles identified in part 1 all have a key part to play in the success of the initiative. While I could write a book on stakeholder engagement my aim here is to look at the problem from a systems / functionality perspective. So in order to determine what can we learn from experience I have put together a collection of pointers to help you prevent your initiative from going down the wrong track, while also focusing on some business impacts that could come into play if you don’t have internal alignment between all stakeholders. The Globally Rolled Up View / Isolated Pockets Approach – If your initiative is focused on just a particular area of the business (Category Line) or even a certain limited geographical area (as most often are) then the results can also cause confusion. For example you manage a supplier in Canada and Alaska yet don’t manage that same supplier in L48, then if even if the supplier’s operations in Canada and Alaska are scoring high on KPIs does that mean you can draw the conclusion that L48 should be fine as well. The answer is no and you need global coverage in order to draw a firm set of conclusions. Also, as the same supplier can operate across many category lines (Directional Drilling, Drill Bits, Fluids etc ) it is very important that all category lines that matter are measured to paint an overall picture of the supplier. Limiting your Initiative to just certain Category lines or Regions can provide misleading results, as can rolled up data, with these results decisions are often made, and mistakes ensue in choosing one supplier over another. As Geographies / Terrain differ, so too does experience by Category line for competing suppliers. Target Setting Consequences – If Procurement or Supply Chain set unachievable high global targets or targets that are too low this will impact ongoing performance levels, especially during cost conscious times. When suppliers feel the bar is too high they stop trying. You need to ensure that Targets just like KPIs have been set by the people closest to the operation. A Procurement team setting Global Targets for KPIs will not work in driving improvement performance levels at the local level. You need to get Operations involved and set attainable regional and category line specific targets for KPIs. 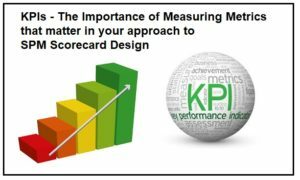 Benchmarking Limitations – Quite often Procurement rush off and seek out Industry specific benchmark reports to act as a means of determining KPI targets for existing and new suppliers. This approach can work in limited circumstances but for more complex services should be avoided. As each Industry, Service Line, and region have their own complexities its not very likely these benchmarks will be comparing like with like in what you are trying to compare. Instead of apples with apples you are comparing apples with oranges. Its better to take guidance at the operations level and this will differ by region. The consequence of doing this wrong could be in awarding the wrong supplier the contract. Performance of Suppliers across Asset Types (Wells, Rigs, Refineries) – As suppliers are often providing the service for a particular asset it is important that the work conducted and associated KPIs can be reported on at that particular asset or group of assets. Key here is the ability to both rollup, and drilldown. Root Cause Analysis Limitations – Too often I see cases where the data gathered is rolled up already by the supplier and passed to the customer for a particular region. While this makes the data collection easier, when you spot a problem you will not be able to drilldown to or even know which particular asset the poor service was delivered to. Without which you are restricted in your ability to perform Root Cause Analysis which is a fundamental concept of improving supplier performance.Often suppliers offer to give you rolled up numbers for say corporate wide Total Recordable Incident Rate (TRIR) or TRIR at a particular region. That will not suffice. While you should accept their Corporate or Regional TRIR value, you still need the Value for TRIR at the Local or Category Line level. One way to do this is to gather Number of Recordable Incidents and Man Hours Worked at the local well site, rig or base level for your operations and compare it to Corporate or Regional Values, That will give you the deviance from their corporate TRIR and all allow you to foster discussions around improvement at that particular asset level. So make sure that your Scorecard questions are relevant to the asset level that the work relates to. You need to be able to view the data and manage supplier performance at the lowest level possible, the asset (Well, Rig, Plant etc)Its up to all parties to agree that data will be collected at the lowest level and that raw data is preferable over calculated values. Its up to IT to ensure that the supplier supplies this data in the format required, otherwise operations cannot drilldown to find the cause of performance deviation. Scorecard Overload / Supplier Data IntegrationOne of the biggest challenges is often the time and effort that the Supplier spend filling out scorecards. Often the supplier has such data already in a structured data format in various systems or databases they operate. The brick wall effect comes into play where there are a lot of scorecards to be completed. Imagine a supplier that works providing a service on hundreds of Onshore wells where the average job lasts a few days. If this data is available in Well View or Openwells you should have the feature that facilitates easily importing such data into your SPM system, or better still a direct link / live feed. I’ve seen the huge advantages and cost savings that brings in reducing supplier scorecard overload. Having IT team involved in your initiative and there buy into this automation is key. Hierarchy Complexities (Upstream V Downstream V Midstream) – As each Category often has a different Hierarchy, with different complexities it is very important that the right hierarchy be agreed on implemented for each of the lines of business. Forcing one Hierarchy that does not work will not allow the flexibility of reporting and rollup necessary for effective supplier management. Competencies – Lack of Category Line Experience / Knowledge Sharing – Another reason that SPM / SRM initiatives can fail is that the people involved in either the Initiative role out did not have the competencies necessary to establish the KPIs to manage the service line. Hence my continued utterance of the need for Operations involvement at the early stage. However even with this there is another equally important phase where competencies come into play and that is during the ongoing Performance Reviews / New Business Negotiations. You need to ensure that the right people are at the Supplier Review Meetings in order to better negotiate with your supplier. Having only Procurement at the table does not always work. The people at the meeting must also have a means of sharing both the meeting actions yet any key learnings that came from the review so that these can be captured and used as a knowledge base for future negotiations, or passed to their colleagues in other parts of the world. Initiative Compliance / Policing – Collecting data for SPM / SRM initiatives can give a lot of information on supplier performance yet its only as good as the completeness of the data. I have seen many cases where scorecards have been entered for jobs that were done well and the scorecards for the poorer jobs remain outstanding. Whether its an IT role or an Operations role to police this there needs to be a way of ensuring that where a job or service has been done / provided that an associated scorecard has been issued. That way you can easily maintain a complete record set. Seeing just good data does nothing for fostering improvement. Performance Review Meetings – Make sure you have a good process for your supplier performance review meetings. Including who should be attending, materials and reports required, frequency, and action tracking. It is also important to ascertain the level of experience / competencies needed for the supplier review meeting. All stakeholders should agree these parameters upfront to avoid spending undue resources on a minor meeting with non strategic supplier. Likewise make sure your framework works to avoid having a lesser qualified team present for a meeting with a highly strategic supplier with high potential business impact. The competency matrix for such can be determined by factors such as Deal Size, Risk, Strategic Importance, and Business Impact. Scope of Initiative / Competing Initiatives – In all organizations there are often many initiatives that to a certain extent cross over each other both in terms of certain functionality and also data collection points. Its important that the management group responsible for the Initiative can where necessary take the decision to shut down other competing initiatives when appropriate. For example local scorecard spreadsheets, other BA / BI Initiatives, and data cubes with Portals that replicate what is already in place the SPM/SRM Initiative. Cutting out competing initiatives that are less progressed and less functional reduces the risk of two sources of truth but more importantly cuts out wastage from the duplicated efforts and the costs of running multiple competing Initiatives. Lack of a consistent approach to managing supplier performance globally and also by category line meaning that the performance scores cannot be relied on for decision making. Lack of true collaboration with supplier on performance improvement. A decrease in confidence by internal stakeholders on the success of any future initiatives based on track record /failed initiatives. Reputational Damage to those responsible for championing the failed initiative. Again, I am not looking apportioning blame or credit to any particular role within the initiative, each has their part to play, and each must understand that there is a huge business impact in not getting this right. Its about working together better during the concept stage, building the business case, and working collaboratively to deliver the end goal of improved Category Management, Relationship Management, improved Performance, and better access to timely information to reduce risks and improve the overall supply chain management process. I hope you enjoyed part 2. If you have any experiences / suggestions around the article feel free to like, or share this post or better still leave a comment / question / suggestion.